Damn, I knew I should have read the the instructions. 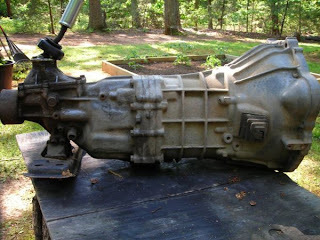 About two years ago, maybe a bit more, I changed the transmission in my faithful, old '87 Toyota truck. The original 4-speed manual was very noisy, to the point where I was getting afraid to go too far. I bought a used 5-speed from some guy in Vallejo. I'm not sure what year it was from but it came with a fuel injected engine (22RE); he kept the engine and I got the trans. I installed the trans without any real problem (same dimensions) but being short of funds and cheap I opted not to buy new gear oil. I had about a half quart of gear oil to which I added two quarts of engine oil, whatever I had sitting around. The transmission worked fine. That is until about two weeks ago. Out of the blue it started popping out of third and fourth gear. I've experienced this before and I was not happy. Syncros. Then I remembered the engine oil in the transmission. Figuring I had nothing to lose I drained the trans and refilled it with 75W-90 GL5 gear oil. I really wasn't expecting a miracle but on the other hand I wasn't looking forward to a) rebuilding the trans, or b) finding another 5-speed and installing it. So I went for the "Hail Mary." It's been a week since I changed the oil and miracle of miracles it worked! The transmission no longer pops out of third or fourth gear. Yes there is still a slight grunch when downshifting into second but that was there all along. I know there may have been some damage done by the engine oil but what the heck, the truck is 25 years old and the transmission around that age so if I have to rebuild it sometime I've bought some time. So the question is why didn't the engine oil work? Syncros work by matching the speed of two gears; essentially they slow down one gear to mesh with another. If the lubricant is too slippery the gear doesn't slow down enough. Sometimes you get gear clash, sometimes the gears don't mesh completely and they will disengage. Gear oil of the proper type has a higher shear strength (its ability to resist being "torn" apart) slowing down the gear quicker and better. That's the simple explanation. And it seems to be working. So from now on I promise to only use the specified lubricants.